Come summer and fall meals are all about vegetables, vegetables, and more gorgeous vegetables in all their plentiful glory. Colorful meals using locally grown vegetables mostly require minimal preparations to bring out their essence and wholesomeness. 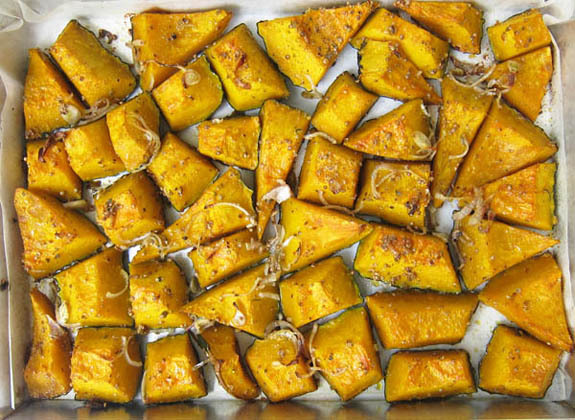 Roasting a pumpkin or squash is remarkably easy and the applications are nearly endless. Chilled and tossed into a salad, topping a crisp baguette for a sandwich, pureed into a soup ( click here for recipe), folded into pasta, or even topping a pizza. Hearty, healthy and flavorsome, pumpkin or squash are full of beta carotene, as well as potassium, and vitamins A and C.
Follow your instincts and get creative. 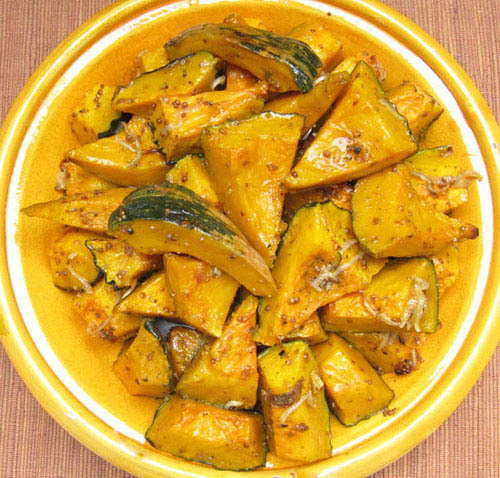 Pumpkin and squash can brightening up seasonal and holiday meals in the most unexpected ways. Remove the stem from the squash and, using a large sharp knife, quarter the pumpkin or squash using a rocking motion as you slice through thick skin. Remove the seeds and membrane and discard, or save the seeds to toast. Slice each quarter into ¾ to 1 inch slices lengthwise and halve each slice and place in a large bowl. Note: there is no need to peel the pumpkin as the skin will become very soft once the bumpkin is roasted. Peel the tough outer layer of the shallots and cut into quarters or eighths depending on the size of the shallots, separate, and add them to the bowl with the sliced pumpkin and shallots. Drizzle the olive oil over all and add the salt and pepper. Toss together until the oil, salt, and pepper is evenly distributed. Transfer the pumpkin slices to the tray, skin side down, and tuck the shallots between the pumpkin slices. Transfer the tray to the oven and roast for about 35 to 40 minutes, rotating the pan after 20 minutes. The pumpkin should be nicely colored, but not overly browned. Remove the tray from the oven and place on a rack to cool to room temperature. The pumpkin can be refrigerated for several days covered with cling film.